This fun filled game will need involvement of just one guest but everyone will burst in to laughter at the end of this game. How to Play: Take print out of this game in your favorite color and secretly ask one guest to note down all the reactions of the bride when she'll be opening the gifts. Like oh I really needed it or it is really nice etc. After the prize opening read all the reactions and comments back. This will give everyone a comical version of the bride's description and conversation with groom on their wedding night. 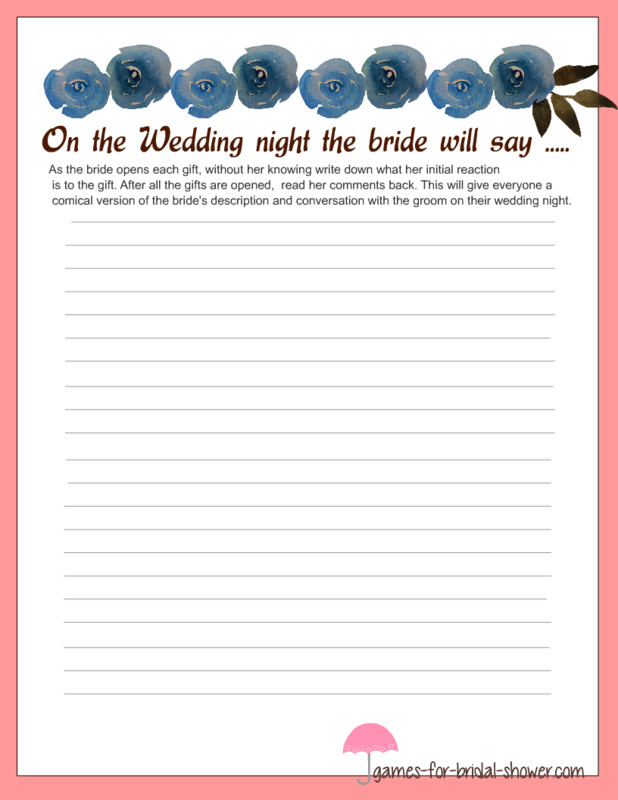 This is free printable stationery for Bride's description of the wedding night game in pink color. Just click on the image shared above and right click and save the larger image to your computer. You can print it using your home printer and you will be needing just one copy of this game for Bridal Shower. This is another printable for this game in purple color. This game is beautifully decorated with image of two love birds. You can save this game just in the way that I have shared with the pink image. This is free printable game in brown color. You can take a print out of this game if it matches your bridal shower party's theme more.